The Digital Britain report advocates the latest step in the war against illegal downloaders, requiring ISPs to write them notification letters and monitor persistent offenders. But what of the other side of the fight against piracy, the effort to win hearts and minds? If you've watched a DVD in the past five years, you may well have seen an advert that sticks in your mind. Cartoonishly raucous music plays as a girl sits in her bedroom downloading a film. "You wouldn't steal a car" a caption flashes as a leather jacketed man interferes with a black Mercedes in a side street. "You wouldn't steal a handbag" flashes another caption. Then it's "you wouldn't steal a TV". "You wouldn't steal a movie" flashes yet another message as a man slips a DVD into his suede jacket. 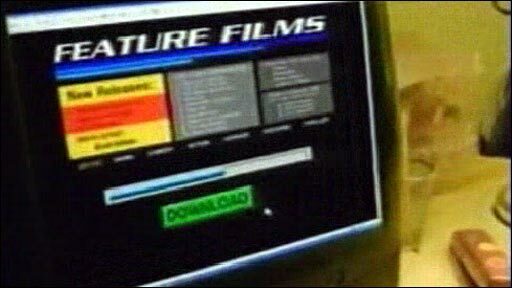 The advert concludes with: "Downloading pirated films is stealing. Piracy. It's a crime." For the duration you may be jabbing the skip button on your remote. It isn't working. Someone really wants you to watch this. Perhaps you leave to make a cup of tea until it's finished, perhaps you stay and really soak it in. Browse on YouTube and you'll see the advert has been parodied many times over. "There have been over 100 parodies," says sociologist Dr Matthew David, co-author of The Impossibility of Technical Security: Intellectual property and the paradox of informational capitalism. Perhaps the best known comes from Channel 4 sitcom The IT Crowd, where the message is taken to a ridiculous conclusion - "you wouldn't kill a policeman". The advert was seen as successful by many in the industry, among other things for the way it stuck in people's minds, but eventually it had to be superseded, says Eddy Leviten, head of communication at the Federation Against Copyright Theft. Pew Internet survey showed 75% of teenage music downloaders aged 12-17 agreed "file-sharing is so easy to do, it's unrealistic to expect people not to do it"
"If you paid for a DVD why should you have to sit through adverts that say you might be a criminal? At the time it was effective. Pretty much everyone has seen it." The issue, Dr David suggests, is that with the failure of Digital Rights Management or criminal and civil enforcement to stem the tide of illegal downloading, the intellectual property industries are engaging in a battle for hearts and minds as a last throw of the die. In some areas they may not have got it quite right in the past. One is the use of the word "piracy" itself. "There is a cachet around piracy," Dr David says. Indeed, one of the most cannibalised advertising logos of all time came in a 1980s campaign from the BPI, the trade body of the British music industry. The stark black and white image showed a stylised skull and crossbones made out of an audiotape, with the legend "HOME TAPING IS KILLING MUSIC" accompanied by the smaller subheading "and it's illegal" has been parodied to the nth degree. 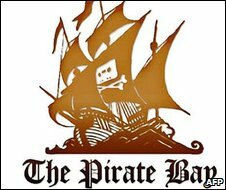 The notorious Swedish website, The Pirate Bay, has as its logo a sailing ship with the home taping skull and crossbones on the mainsail. "A lot of people criticised it, but my, it had legs," says Richard Mollet, director of public affairs at the BPI. And there is similar attitude within the film industry to the advert known to many as "you wouldn't steal a handbag", made by the Motion Picture Association of America in 2004 for worldwide use in a host of languages. Now, the film and TV industry's anti-piracy drive has gone off down different avenues in different countries. In the UK, the emphasis is on achieving an "attitudinal change" using more subtle means. The PR agency Blue Rubicon specialises in this field, typically advising on health campaigns such as the clown smokefree message pictured right. Now it is helping the UK film and television industry in "attaching social stigma" to illegal downloading. "Absolutely, campaigns can change hearts and minds," says Blue Rubicon director Gordon Tempest-Hay. "If you do them right you can make a material impact on people's behaviour. Drink driving, anti-tobacco, even going back to the old clunk click [seatbelt campaign]." The result of Blue Rubicon's work is the "knock-off Nigel" campaign. The avoidance of the word "piracy" in the adverts is significant. "Knock off is grubby, you have got something a bit rubbish," says Mr Tempest-Hay. And there certainly is an attitude to change. A lot of people in the UK download illegally. A recent report by the Strategic Advisory Board on Intellectual Property picked up on the work of US criminologists Sameer Hinduja and Jason Ingram, who have adapted the theory of "neutralisation" to explain why many young people have no problem with infringing copyright. "Much deviance by young people happens despite knowing what they are doing is wrong," says criminologist Dr Richard Jones, author of Entertaining Code: File Sharing, Digital Rights Management Regimes, and Criminological Theories of Compliance. Of course, there are plenty, even among the young, who can be eloquent about why they believe illegal downloading is not wrong. These can include everything from what they see as the unacceptable "control freakery" of DRM and regional coding, to overcharging and exploitation of the very artists the music industry claims to protect. In the US the "Think First, Copy Later" educational campaign has been criticised by the Electronic Frontier Foundation for intimidating and misinforming children. But the educational material provided by the film and music industries in the UK is extremely subtle, only occasionally alluding to piracy, as it attempts to explain how the industry works. "There is no lecturing or hectoring going on at all," says Ian Wall director of Film Education. Children are supposed to gently arrive at the conclusion that if creativity is good, and content is valued, then copyright infringement may be wrong. And for all the doubts about whether campaigning can change attitudes, those in the industry are confident. Research done for the British Video Association from 2007 to 2009 suggested illegal downloading would be 5% worse if it wasn't for the industry's campaigning. Enforcement and tighter regulations are a big part of the industry's efforts, but much weight will be on educating the next generation of downloaders to behave themselves. And in the future DVD viewers can expect adverts that are a little less annoying. I do resent having to sit through anti-piracy adverts on genuine DVDs that I own and paid for. The irritation is such that you almost wish you had a pirated DVD as that would, ironically, NOT contain the annoying advert! Disney has the right idea with their anti-piracy warnings, highlighting the dubious quality you would get with a knock off rather than pushing the "illegal" angle. I would rather see people taking pride in quality than feeling criminalised by an advert. 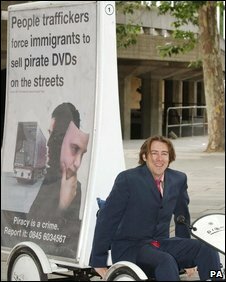 And the human cost of pirated DVDs is Jonathan Ross, eh? Who would have thought? I'm happy to pay and always have been. The problem is that the price is too high. How is it that a download requiring no disc no cover sleeve no transport or shop labour can cost the same as a hard copy bought in a shop? All that has happened is my interest in music and films is stifled. I don't download legally or illegally. The distinction blurs between stealing from a company and disagreeing with its greedy business model. The business model of charging a high price for popular intellectual property is unmaintainable and needs correcting eg: musicians in countries with lots of free copying do more live concerts with demand fuelled by the copies. Other business models include: sponsorship, advertising, spin offs, merchandising. Or encourage "correct" purchasing by special offers, personalization, inclusions, special access. Instead of talking about morality, smart companies should be thinking up new ways to separate us from our money. These campaigns are a very noble cause. They're trying to fight counterfeiting. Counterfeiting is a serious crime. It takes massive organisation and capital to sustain a counterfeiting ring - 99 times of 100, counterfeits are made from a purchased original. Counterfeits are sold on the black market, and sometimes are passed as originals. Counterfeiting rings are usually run by organised crime such as mafia. Other types of criminals such as human traffickers and drug dealers sometimes get into the counterfeiting business. These criminals will counterfeit anything from DVD movies to perfume to expensive purses to pharmaceuticals. What I want to know is, what has any of that to do with downloading music and movies on the internet? If only I had the bandwidth to download knock-off films. The biggest thing the industry has done to combat piracy and downloading has been the cheap DVD. Every so often you can pick up a classic for £3, even some recent films. I like having the packaging and having something tangible. Some people may think the pirates are providing a service by getting rid of the unskippable anti-piracy ads and trailers. For some reason the content publishers seem to want to punish their customers. How about in the future we get movies without adverts - that would be much less annoying. The record industry might be better advised to put its own house in order first, not tying artists to crippling contracts and considering a more realistic pricing and distribution strategy for its products, before pursuing 15-year-olds sharing files from their bedrooms. Should somebody tell the man in the video that he's holding his flute the wrong way with his right hand? It's unlawful to copy a CD or DVD onto an iPod in the UK yet nobody suggests young people should not do this. Why is this still unlawful in 2009? Because the minister in charge of IP is the third one in the space of a year. The current one, David Lammy, is a schools and education specialist with no background or real passion in this area. The government needs to take a strong lead and resolve some of these difficult areas before the creative industry in the UK dies a death. Sharing digital information, ideas, knowledge, and culture is not wrong, and should not be illegal. We in the Pirate Party United Kingdom are campaigning for copyright reform and a reduction in the duration of copyright. We also believe that non-commercial sharing of media by private individuals should not be a matter for copyright law. Commercial counterfeiting is a different matter, as it involves deception and fraud by the seller, and an actual financial transaction with measurable harm - private copying or format-shifting does not. I don't buy many DVDs and I've never pirated one but that film brought me as close as it was possible to. It annoys me every time I play a DVD that a 'pirate' is getting on with watching his film while I'm waiting for access to what I've paid for. The problem with the Knock-off Nigel campaign is it's instantly outdated viewpoint. Whereas in the 80s this may have worked with the low quality bootleg videos that were your standard pirate copy, the technology today produces DVD quality that is an exact replica of the original, so the 'grubbiness' factor is severely reduced and the campaign weakened. It shows no understanding of modern 'piracy' so I just don't see it having an impact. I legally bought a DVD in a museum in Montreal and arrived home in Switzerland to discover that it wouldn't play in Europe. I was furious, and I still am. Stealing copyright material is clearly wrong, but the industry is certainly not winning hearts and minds with tricks like this. It needs a new business model.